The Liberate! API Trans and Queer Youth Leadership and Activism Award aims to recognize the leadership and activism of Asian American and Pacific Islander (API) trans and queer young people across the country who are organizing and advocating to improve school climates, promote LGBTQ-inclusive spaces, prevent violence and discrimination based on sexual orientation or gender identity, and reform school discipline practices and policies that push LGBTQ+ youth of color out of school. 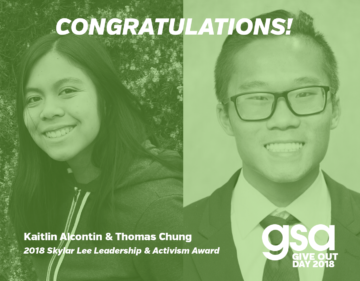 Launched in 2018, the award was created in memory of Skylar Lee, a GSA youth leader from Madison, Wisconsin, who believed in the power of intersectional youth organizing. Now in its second year, the Liberate! API Trans and Queer Youth Leadership and Activism Award will expand its scope to recognize the various ways in which API LGBTQ+ youth are changing their schools and communities. The application is open to API trans and queer youth activists who are currently enrolled in high school, continuation schools, or alternative school settings anywhere in the United States. Award recipients will be presented with a $1,000 award in July 2019 at the National Gathering of GSA Networks taking place in Albuquerque, New Mexico. National Gathering is an annual conference that brings together nearly 100 youth and adult organizers representing social justice organizations from across the country to build skills and strengthen the LGBTQ+ youth movement. Travel and accommodations will be provided for award recipients to attend National Gathering. We encourage applications from young people who have a bold vision for liberation, demonstrate a passion for organizing and advocacy for racial and gender justice, and understand the importance of building an intersectional GSA movement. The deadline to submit applications is Friday, March 29, 2019 by 11:59pm Pacific Standard Time. Award recipient(s) will be notified in April 2019. The award is open to LGBTQ+ Asian American and/or Pacific Islander high school students who are leaders in their GSAs and are organizing and engaging in activism at the intersections of gender and racial justice. To apply, please complete all questions in the application form below and note word limits. You will not be able to save your responses and complete the application at a later time. We recommend that you prepare your responses in a separate Word document and then copy/paste into the form when ready for submission. Paste as plain text and update using formatting options below. Applications must be submitted by Friday, March 29, 2019 by 11:59pm Pacific Standard Time. Please contact communications@gsanetwork.org if you do not receive a confirmation email of your submission. Finalists may be invited to a telephone interview in late March.